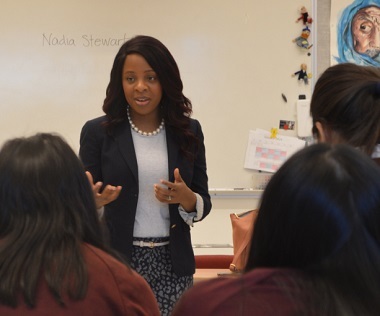 Nadia Stewart speaking at an all girls Catholic school. Nadia Stewart is a videojournalist / reporter for Global BC, and a former anchor / reporter for CBC and CTV. She attends Calvary Worship Centre in Surrey. I don’t remember too many of the guest speakers who came to speak to my classmates and I when we were in high school. So, whenever I’m invited to a school, I seize the opportunity to give to them what I wished someone had given me: honest advice. For the last couple of years, I’ve had the privilege of speaking at an all girls Catholic school in Vancouver. There’s something about speaking to a room full of smart, beautiful young girls: they’re at a critical stage when they need to hear nothing but support, encouragement and wisdom from the generation before them. My hope and prayer is to be one of those voices. Life itself is full of ups and downs but, in this industry, the highs are high and the lows are low. Over the years, I’ve learned to enjoy the highs and survive the lows – but it hasn’t always been easy. Most of the students I speak to don’t plan on pursuing a career in journalism, but the principles I share with them are timeless and transcend the sector I’m in. Be good at networking. Sometimes, it really is about who you know. Don’t be sleeping on that LinkedIn profile! Don’t ever let fear hold you back from introducing yourself to that person in the room who you think is at a level much higher than you! You never know who might be the divine connection to help you get from where you are now to where you need to be. Be a risk-taker. Step outside of your comfort zone. Do it early and do it often. So many people limit their success because they’re too afraid of the what ifs. Don’t be held back by a fear of the unknown. Be fearless. Don’t be afraid of what you don’t know. Don’t shy away from change or challenge. Don’t dwell in mediocrity because you’re too afraid to go, to do or to be. Start something new. Do something no one else has done before . . . and do it boldly. Be Focused. Most people don’t know this, but I begin my day with prayer. In this life, there are so many things thrown our way and I have no idea what tomorrow holds. My faith in God through Christ is my firm foundation: no matter how rough the storm, I know I will always come out better on the other side. Prayer keeps me focused on what matters: connecting me with my divine purpose and keeping me on the straight and narrow path. Be prepared for setbacks. They are going to come – I can guarantee it. Something will be thrown your way and, if you aren’t ready for it, it could destabilize you. One of my favourite Bible verses is Romans 8:28: “All things work together for the good of those who love the Lord and are called according to his purpose.” All things – even the bad things – work out for my good. I learned this lesson firsthand after I lost my job, but got a new one that I didn’t even go looking for: they came looking for me. So, have faith in God: your setbacks could be setting you up for success. Be your biggest investor. Your teachers will invest in you, your parents will pour into you . . . but make sure you are investing in yourself. Upgrade your skills by taking a few courses, go back to school for that degree, or take that much-needed break you’ve been postponing (because resting is investing!). Spend the time, money and energy needed to ensure you’re the best you can be. This comment is re-posted by permission from Nadia Stewart’s Black Girl Reporting blog. ← Around Town: Multiply Conference, NOLA funding, Thomas Aquinas Fest . . .